I had a fun Mother's Day weekend showered with food, presents and extra pampering. Nikolai made breakfast with a little help from daddy on Sunday, serving my favorite bacon, scrambled eggs, pancake muffins with choc chips, pudding and some fruits. We saved some pancake muffins for his bento since he suggested that breakfast for lunch would be good on Monday. We went to Universal Orlando sometime back and of course enjoyed the rides. Nikolai, while we were there, purchased a plush backpack, plush toy, drink container etc from the Universal store as he was excited about the Despicable Me characters then. He showed no interest in them after several weeks later and I think he only used the backpack for a couple of times. When we ask him he'll reply, "yes, I still like Minions" and quickly return to his greater interest. Since no one was interested in the cake decorations after the pictures were taken at my friends child's Minion themed birthday party, I asked if I could keep the decorations! So, here are a couple of Minion themed lunches in which I used the cute accessories from a party to create. The first lunch was a sandwich cut into circle shaped with my favorite circle cookie cutter topped with a Minion on float cake decoration, his sides were organic baby carrots with hummus for dip, Annie's organic cheddar bunnies with a minion pick, a Babybel cheese with the letter 'G' cut-out and organic kiwi slices, packed in a Planetbox rover. 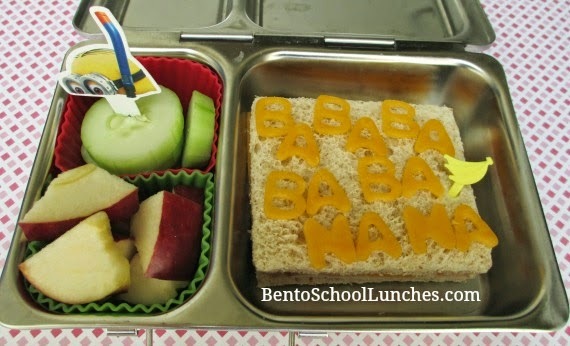 The next lunch was so easy to make, I removed the crust from the bread and added some cheddar cheese alphabet cut-outs "Ba Ba Ba, Ba Ba, Na Na" with a banana pick on the sandwich. 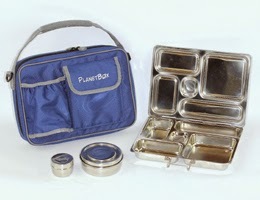 His sides were cucumber slices with a minion pick and apple slices, all packed in a Planetbox shuttle. Cute lunches, my kids love the minions! How sweet of Nikolai! 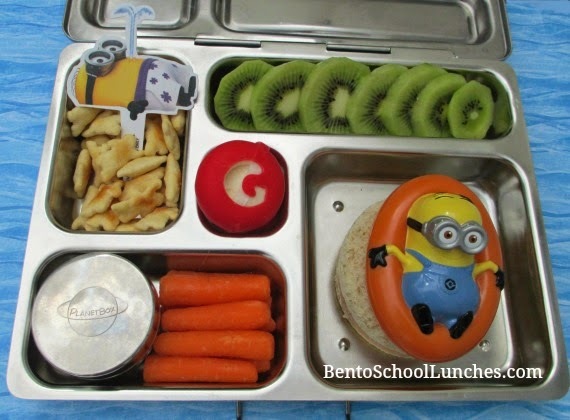 Love your Minions bentos. Thank you so much Ming. I am so glad to know that you love them.